Krinos Taste of the Danforth is a popular annual street festival in Toronto that takes place in and around the Greektown BIA every August in Toronto. It began in 1994 with just 5000 attendees and now it's Canada’s largest street festival with well over a million people attending every year. The well-attended event celebrates not only Greek food and culture, but also the many other restaurants and vendors along the western end of the Danforth (of which there are many). Several blocks of The Danforth are closed during the festival and admission to the area is free. Of course, you'll want to bring plenty of pocket money to sample the deliciousness on offer, of which there will be quite a lot. 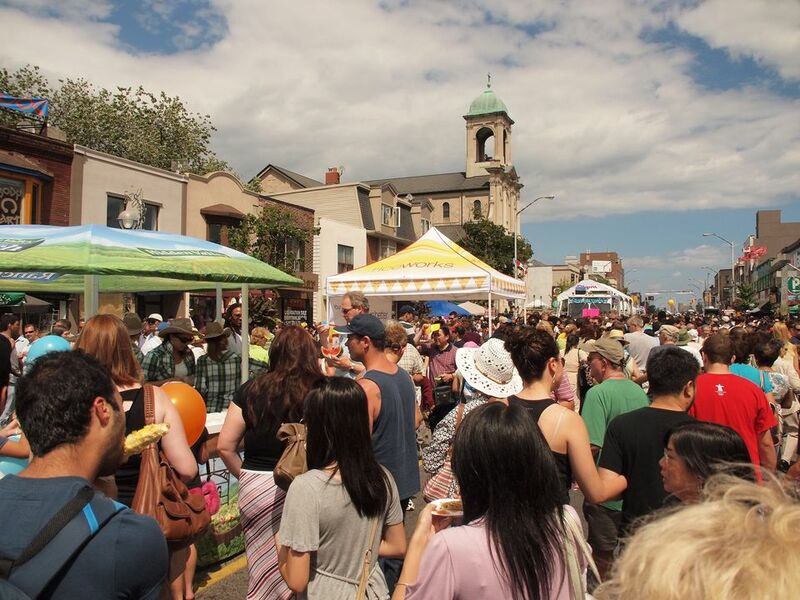 If you're not a fan of crowds, however, you may just want to visit the Danforth on your own another time because Taste of the Danforth can get very busy, especially on the weekend afternoons. As the name suggests, Taste of the Danforth is held on Danforth Avenue. The street is closed between Broadview Avenue and Jones Avenue, which is the section just east of the Don Valley. The event usually takes place on the first weekend in August, from Friday to Sunday. In 2018, Taste of the Danforth takes place from August 10 to 12. There are a few ways to make your way to the festival, but the best way to get to Taste of the Danforth is by subway. Broadview, Chester or Pape Station will all bring you right into the action, and Donlands is just to the east of it. You can get off the subway at one end; walk, watch and eat; then get back on at the other end. How easy is that? Biking to the area is also pretty simple using the Don Valley Trail or the Jones Avenue bike lane, but maneuvering in the crowd will be tough. You'll probably want to lock up outside the festival area. Driving isn't recommended, but there are several Green P lots in the area. Just remember you won't be able to use the Danforth to get to them so public transit really is your best bet if it's a viable option for you. The main draw for the event is, of course, all of the delicious food. Most restaurants in the area come up with a few special selections that are easy to eat while walking or standing and serve them up from a table or cart on the sidewalk. There will be lines for food, but they usually move fairly quickly. Expect lots of options for gyros, filled pitas, and souvlaki skewers, but in addition to the Greek-focused fare, you'll also find flavors from all over the world, such as Japanese, Italian, Indian and Mexican cuisine. Desserts are readily available to cap off your day of eating, and there's usually a few stands with carnival type food such as roasted corn, ice cream, or other smaller sweet treats. In 2016 there were churros on offer, as well as baklava sundaes - so you never know what interesting culinary finds you might come across. Food isn't the only thing Taste of the Danforth has going for it. Eating might be the main draw, but come for the food and stay for the entertainment, of which there is lots to choose from. Three outdoor stages are spaced out along Danforth for the festival. Generally, one stage focuses on Greek culture and music, while the other two offer programming and music to suit many other tastes, from rock and pop to samba and funk. Enjoy live music, dance, street-style performers and more. There are also activities for kids and a sports zone with fun interactive activities and challenges, and some licensed patio seating where you can watch the fun unfold with a cold beer in hand. Come with a healthy appetite and with your hands-free for easy eating-while-walking. Bring cash so it's easier to make food purchases. Be patient when lining up for food. Lines look long, but they generally move pretty fast. Wear a shirt you don't mind dripping tzatziki on when you engage in said eating-while-walking. What you should expect in Toronto on Labour Day.